For many years now, we have known how dangerous tobacco smoking is to health. The list of ways it can harm smokers seems to grow longer every year, as more and more research is conducted. Children, as well as pets, are at risk from smoke in their environment. It’s fairly well known that smoke from cigarettes (and all other tobacco smoke sources such as pipes and cigars) can harm non-smokers via passive intake, or “second-hand” smoke. Children as well as pets are at high risk from smoke in their environment, due to their size and sensitivity. Since the discovery of this added risk, steps have been taken to reduce the exposure non-smokers receive. So far, 30 U.S. states and 20 foreign countries have enacted laws restricting or prohibiting smoking in public areas, as well as businesses. The biggest reason pets all over the country are being exposed to second-hand smoke is that people are simply unaware of how serious the danger is. Smoking awareness campaigns are trying to change this, but it is a slow process. These dangers are not a new discovery. Studies have been conducted since the 1990s on this issue. For example researchers at Tufts University studied two groups of cats. One group came from homes where they cats were exposed to second-hand smoke; the other group came from homes that were smoke-free. 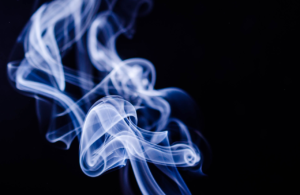 Other research has found that, even when no one in a home smokes, if they live in an apartment next to a smoker, that smoke can still get into your space and cause the same issues. As if all that is not shocking enough—it is not just second-hand smoke that causes problems. Recent research has found that “third-hand smoke” is also a problem; and it may affect pets even more than people. Just think about the things your pet licks throughout the day. Every time the pet eats, drinks water, or grooms herself, she is ingesting toxic third-hand smoke. This is a serious problem for cats, because they spend more time and are more thorough in grooming than other pets. Second-hand marijuana smoke also has harmful effects. This is a growing problem, as more states are legalizing medical and/or recreational marijuana. Currently, Alaska, Colorado, Oregon, and Washington have legalized it, and more are likely to join the list after the November 8 election, including Arizona, California, Maine, Massachusetts, and Nevada. Pot smoke is set to create a widespread hazard for our pets. The “high” experience appears to be unpleasant for animals. Unlike the enjoyable sensations people usually get with marijuana, pets become depressed, disoriented, wobbly, and often incontinent (involuntary urination). Their heart rate and body temperature drops. Effects can last up to 72 hours. With the new, stronger pot strains, there’s a risk of increased excitability, high fever, tremors, seizures, and possibly coma or death. Deliberately exposing pets to pot smoke may also be considered abuse under most state laws. Tests have shown that just one minute of exposure to marijuana smoke alters the function of blood vessel lining cells (endothelial cells) for 90 minutes—even longer than tobacco smoke! While it’s too soon to tell, long-term cardiovascular health is likely to be compromised in pets exposed to marijuana smoke. Veterinarians are reporting a sharp increase in the number of pets needing emergency treatment for marijuana toxicity in states where its use is legal; particularly for dogs who have eaten a large amount of buds or edibles. To reduce the potential harm of marijuana smoke, consider using edibles instead. Just be sure to keep pot and pot-containing edibles securely out of reach of pets—and kids! E-cigarettes were originally intended as a bridge to quit smoking, but more and more they are being used as a standalone pleasure, especially for young adults. The cartridges are a special danger to pets, especially those that contain nicotene; if an exploring tooth punctures one, it can be fatal. New research is finding some serious dangers to smokers themselves; the second- and third-hand smoke risks are reduced, but not eliminated. Nicotine is still present, albeit at lower levels. But vape smoke alone causes oxidative stress and increased free radical generation in animals exposed to it. This has been shown to disrupt the immune system and makes the animal more susceptible to viral and bacterial infections. Just like children, our pets do not deserve the additional risk they are exposed to by living with a smoker. So what can be done to minimize the harm that comes to them? Unfortunately, no other solution is adequate. Studies that have been conducted on the spread of second- and third-hand smoke have shown that tactics like opening a window while smoking, or smoking in another room, simply do not work. Even these measures will not totally eliminate your pet’s exposure. Third-hand smoke will still cling to your skin and clothes. But it is a significant improvement on smoking anywhere indoors. With winter coming, the need to smoke outside could be disconcerting news. But if you do not go outside to smoke, you will be harming your pet. Perhaps this is a good time to consider quitting! Whatever decisions you make for yourself, please help spread the word about the dangers of second- and third-hand smoke for animals. We need to ensure that our pets are protected from this insidious danger! Bertone ER, Snyder LA, Moore AS. Environmental Tobacco Smoke and Risk of Malignant Lymphoma in Pets. American Journal of Epidemiology. 2002; 156(3):269-273. Singer BC, Hodgson AT, Nazarof WW. Effect of sorption on exposures to organic gases from environmental tobacco smoke (ETS). Proceedings: Indoor Air 2002, 2002. Sleiman M, Gundel L, Pankow J, et al. Formation of carcinogens indoors by surface-mediated reactions of nicotine with nitrous acid, leading to potential thirdhand smoke hazards. Proceedings of the National Academy of Sciences, February 8, 2010. Sussan TE, Gajghate S, Thimmulappa RK, Ma J, Kim J-H, Sudini K, et al. (2015) Exposure to Electronic Cigarettes Impairs Pulmonary Anti-Bacterial and Anti-Viral Defenses in a Mouse Model. PLoS ONE. 10(2): e0116861. Wang X, Derakhshandeh R, Liu J, et al. One Minute of Marijuana Secondhand Smoke Exposure Substantially Impairs Vascular Endothelial Function. Journal of the American Heart Association. 2016 Aug; 5(8): e003858. What if your pet gets into YOUR medications?